Menulog delivers for Yiro Yiro Greek Street so you'll be able to track your courier on a map. Comes with choice of meat, tzatziki, tomato, onions and chips. Comes with choice of meat, tzatziki, Greek salad, chips and pita bread. Comes with lamb, chicken and pork yiro meat, tzatziki, Greek salad, chips and pita bread. Comes with 2 x Lamb, 2 x Chicken and 2 x Pork Skewers, 1 x Tzatziki, 1 x Greek Salad, 1 x Chips and Pita Bread. Come with a choice of meat, tzatziki, tomato, onions and chips. 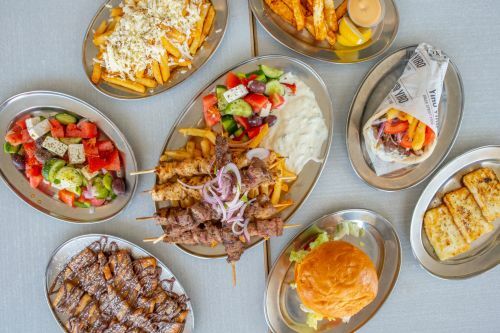 Come with 2 x Skewers,1x Tzatziki, 1 x Greek Salad, 1 x Chips and Pita Bread. Come with 2 x Lamb, 2 x Chicken and 2 x Pork Skewers, 1 x Tzatziki, 1 x Greek Salad, 1 x Chips and Pita Bread. Angus beef, cheese and tomato sauce. Angus beef, cheese, lettuce, tomato, grilled onions, beetroot and yiro mayo sauce. Angus beef, cheese, lettuce, tomato, grilled onions, pineapple, bacon, egg beetroot and yiro mayo sauce. Double Angus beef, double cheese, lettuce, tomato, grilled onions and yiro mayo sauce. Grilled spicy chicken, lettuce, tomato, chilli, cheese and yiro mayo. Grilled Mediterranean chicken, lettuce, tomato, feta and yiro mayo. Char-grilled chicken breast, lettuce, pineapple, cheese and yiro mayo. Gourmet veggie patty, cheese, lettuce, tomato, beetroot, grilled onions and yiro mayo. Tzatziki, taramasalata, spicy cheese or special yiro mayo. Pastry with nutella and icing sugar.